The above image* was taken by Ian Usher at a co-design event just before I joined Mozilla in May 2012. It shows me in conversation with Oliver Quinlan (left) and John Bevan (right) both of whom are now at Nesta. Oliver’s written a book called The Thinking Teacher which I began reading this week. It’s a really clear and well thought-out approach for those who want to take a step back and think what it is that we’re actually doing when teaching others. For a limited time his book’s on special offer via Kindle for the bargain price of 99p. You should buy it. There are few other careers than teaching where everyone entering already has thirteen years of experience in the workplace. Great observation. This is why (some) parents seem to think it’s OK to tell you how to do your job – and why edtech entrepreneurs think they know how to ‘fix education’. Of course, spending time somewhere as a ‘consumer’ is not the same as working there. It’s an imperfect analogy, but anyone who’s ever worked in a shop that they’ve also bought things from will know the difference between front and back of store. If we are in the business of teaching and learning we have to believe that most things are learnable. All things being equal, it is possible to make significant changes in yourself and to learn. Of course, many things are situational: I am never going to be an Olympic gymnast – I am too old and my body is past it already. However, with enough time, dedication and practice I could certainly learn some gymnastic skills and improve. I think the important insight here is that you don’t have to have the capacity to be the best in the world at something to derive use and satisfaction from getting better at it. Our world all too often tells us differently and it’s up to us as educators to push back on the holistic value of learning. Although I’ve heard this paraphrased before, I never knew it was a quotation from George Bernard Shaw until Oliver used it to introduce one of his sections! Such a great and widely-applicable way of looking at the world. Great teachers are immersed in their field, not as a syllabus but as a changing, developing entity, with new areas to discover and new questions to ask. This is one of the things I miss about teaching. My field was History, but even that was an ever-changing landscape based on discoveries (‘out there’ and my own) as well as different intepretations and ways of visualising the past. We can apply this mindset to any area, though – for example I’m trying to ask new questions about what it means to be ‘literate’ on the web. You should write your book this year. Seriously. People are waiting to hear your unique take on life. They want to find out more: what do you wake up every day thinking about? For those of you who blog regularly, why not select your best posts and self-publish? Curate your stuff and put it out there for people to read! Books help you reach out of your echo chamber. You can create a book using your favourite word processing software, export it to PDF and sell it on Gumroad. Or do as I’m doing for the two books I’m writing this year and try out Leanpub as a total solution. If you want a physical copy, I’ve had success using Lulu. There’s something about having a physical copy in your hands but, either way, it’s the intentional curation that counts. You know, I bought myself a cheap bit of wall art before Christmas. It’s ironic given the title of Oliver’s book, as it says THINK LESS. DO MORE. Some of us need to do less doing and more thinking. But for me, my motto for 2015 revolves around less thinking and more doing. What’s yours? ** If that link doesn’t work, try this one (archive.org)! Update: I abandoned (and refunded) those who bought these ebooks. Instead, I’ve turned #uppingyourgame v2.0 into an audiobook. Check it out here! TL;DR: In 2015 I’m going to write #uppingyourgame v2.0: a practical guide to personal productivity and The Essential Elements of Digital Literacies: the workbook. You can buy each one for $0.99 + tax (~£0.79) right now and you’ll get every update to v1.0. I’m excited to announce that I’ll be writing not one, but TWO e-books this year! Many thanks to those who took the time to respond to my call to ‘vote’ on what I should write next. Some people commented on the post, some direct messaged me, and some emailed. The outcome of all this was that, somewhat surprisingly, the Open Badges e-book I’d proposed wasn’t as popular as the other two. It was neck-and-neck between #uppingyourgame v2.0: a practical guide to personal productivity and The Essential Elements of Digital Literacies: the workbook. So, instead of choosing one, I’ve decided to write both of them concurrently. I’ll spend the most time on that ebook that has the most backers. Whatever happens, I’m planning to finish both of them by the end of the year. While I’ve been very happy with Gumroad as a platform for selling the finished version of The Essential Elements of Digital Literacies, I’m going to try LeanPub for these two new ebooks. I like to write (and sell) ebooks iteratively as it allows me to get feedback from those invested in the content. For previous books following the OpenBeta process I used a manual, system I strung together myself. I’m hoping LeanPub makes this a lot more streamlined. You can buy #uppingyourgame v2.0: a practical guide to personal productivity and The Essential Elements of Digital Literacies: the workbook in their current form today. That is to say, you’ll get an indicative overview of what the books will cover for the princely sum of $0.99 + tax (~£0.79). The reason you might want to buy now rather than later is that at each milestone I’ll be increasing the price of the ebooks until they’re finished. You also get to help shape the finished version by giving me feedback. 5 things I can do with my Kindle that you can’t with your dead-tree books. 1. Read things I save for later using Instapaper. 2. Sync highlights and comments to Evernote. 3. Search for a quotation or section in a book. 4. Look up a word in the built-in dictionary or a concept at Wikipedia. 5. Use the built-in 3G to navigate Google Maps via the browser. Your anti-ebook rhetoric is like a broken record. To be honest, I’m not particularly bothered whether you, on a personal level, decide that you don’t like ebooks and you prefer dead trees. I actively prefer the former over the latter, so I do mind your Luddite-style arguments attempting to castigate others whilst appealing to some kind of external, objective value. If you’re in a position of influence within an organization, then your reactionary stance on ebooks makes you a barrier. That’s great! Good for you. My liking ebooks obviously makes me A Bad Person. …the smell, the cracking of the spine, etc. Erm, that’s a fetish. I completely take onboard your point about reading anything of any length on a backlit screen. But that argument just doesn’t stand up with e-ink screens as featured on the Amazon Kindle. Got a different anti-ebook argument? I’d love to hear it in the comments below! I like paper books because I can stick them in my purse and they never run out of batteries! 10 reasons I like reading ebooks more than paper books. 1. I can carry hundreds – if not thousands of books around with me. Which means reference library everywhere I go, and the ability to have several books (e.g. novel/business/academic) on the go at once. 2. Finding out the meaning of an obscure word takes about two seconds. 3. I’ve got instant access to pretty much any book I want. 4. Highlighting is portable, either via the Amazon website (if one of their titles) or a text file (if one you put on the device). 5. Weight. Many of the books I read for work, pleasure and study would be fairly weighty tomes. It’s easier on my arms – and my luggage! 1. It’s virtually impossible to ‘lose your place’ in an ebook. 3. 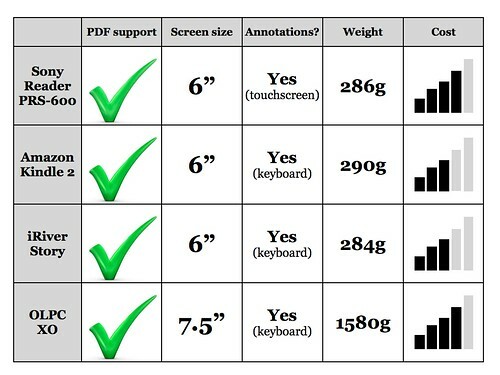 You can change the font size – or even the font type in some cases. Some paper books are set in tiny, horrible fonts. 4. I love 19th-century fiction (especially Dostoevsky, Tolstoy and Gogol) which means many books I want to read are completely free. 5. Speed. It’s only anecdotal, but I’m positive I can read faster on my Kindle. Audiobooks. I love being able to decide to listen to a book instead of reading it when my eyes are tired from work. * I’ve got the previous generation, but with a cool, limited-edition Moleskine cover. Awesome. I decided last week to sell my Sony Reader PRS-600 Touch and replace it with an Amazon Kindle. Why would I do that? After all, you can do things with the Sony that you can’t with the Kindle: ‘reflow’ PDFs, write notes using a stylus, add extra memory with the minimum of fuss? I’ll perhaps compare and contrast the Sony Reader and the Kindle in more depth another time, but suffice to say that the things that the Kindle can do – namely wirelessly sync, have access to other people’s annotations, and make notes using a keyboard – slightly edge out the Sony Reader for me.